As a branch of the Supreme Court, the Appellate Division has broad powers to review questions of law and fact, and to make new findings of fact. It serves as the court of original jurisdiction in certain types of matters; other cases reach the Appellate Division after they have been reviewed by the Appellate Term, a lower appellate court. Since, with few exceptions, appeals to the Court of Appeals, the State’s highest court, are by permission only, the Appellate Division is the court of last resort in the majority of cases. Over 3,000 appeals, 6,000 motions, and 1,000 interim applications are determined each year. In addition, the Appellate Division admits roughly 3,000 new attorneys to the Bar each year, disciplines practicing lawyers, and otherwise exercises its judicial authority in Manhattan and the Bronx. The statewide Practice Rules of the Appellate Division ([22 NYCRR] part 1250), adopted by the four Judicial Departments of the Appellate Division, became effective on September 17, 2018. 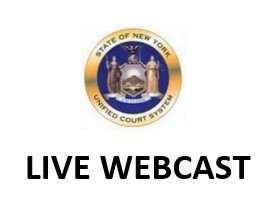 By order dated June 22, 2018, the First Judicial Department rescinded (22 NYCRR) part 600 and adopted a new part 600 to supplement the statewide Practice Rules of the Appellate Division. The new part 600 became effective on September 17, 2018. Presiding Justice Acosta announces that the First Department will hold session in the Bronx Hall of Justice on April 24, 2019 at 2:00 pm. The Court's policy statement regarding the use of Portable Electronic Devices is available here. If you need a reasonable accommodation under the American with Disabilities Act (ADA) in order to access the archive of a particular argument, please contact Margaret Sowah, Deputy Clerk of the Court and the Court’s designated ADA liaison by email at AD1ADAliaison@nycourts.gov or 212-360-4987.